They have gold coloured Roman numerals with gold coloured filigree style hands. Singles are chosen for effect rather than artist, and it’s always a surprise to see what you get. 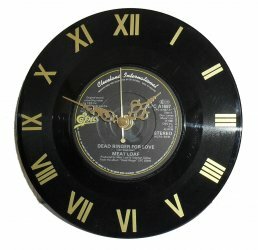 If you would like a specific record however, and send it to me I will make a clock out of it. Please be aware that these are recycled items and may have small scratches etc! If payment by cheque I will send a soon as it is cleared, by postal order sent immediately.